Mopar or no car, baby. “What the hell?” was my reaction when I came across this in the despicable Suggested Listings section of our favorite app. That was followed by a “oh my god” and a few other choice phrases that include expletives that I can’t repeat here. Look, I’m a newcomer to the Ertl brand, and I had no idea a 1:18 Chally existed, besides the I-should-have-bought-it-a-long-time-ago Hellcat from GT Spirit and the dreadful Challenger Concept by Maisto. And then you dangle a PLUM CRAZY one in front of me and the rest is history. My large-scale ‘Murica collection is currently in its infancy, but we’ve been making substantial headway as of late. SN210's unwelcome ‘Vette donation. The better-looking Bullitt. The ACR. And now this, along with GT Spirit’s Demon, have joined the fleet. The floodgates have been opened. I won the auction for this one at just over $100 shipped. I don’t know what these types of models go for, but that was a price I was willing to pay for the right car in the right color combo - which this absolutely is. 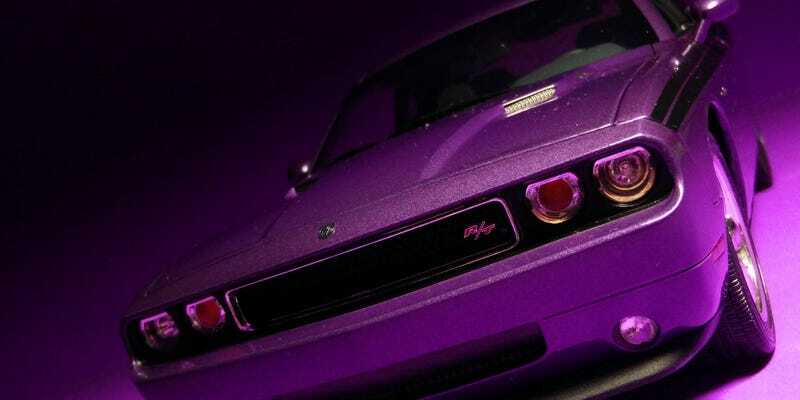 Plum crazy, need I say more? The level of detail on this thing is better than I had imagined. It’s obviously no AUTOart, but certainly better than a Norev or Minichamps. A couple of things I don’t like are how squared-off the tires are, and how the rear sits lower than the front. From some angles, it just looks weird. Otherwise, it’s a pretty sick ride.